August 27th, 2018 was the anniversary of the women from Cardiff walking to Greenham Common 37 years ago. Frankie was singing at Chepstow at a gathering of women involved – singing songs she wrote inspired by the Greenham women. It was this walk that led to the Greenham demonstrations and Peace Camp. • contexts in which this approach can be applied. Participants will be provided with a course handbook which will support the work covered on the course and also includes practical information on areas around freelance working as a voice leader. As well as bodywork being an integral part of the training course, there are daily body/voice preparations sessions, focusing on aspects of body release and energizing that relate directly to vocal expression. In addition to this daily physical preparation, visiting specialist Darien Pritchard will help participants understand the anatomy around breathing and will use his expertise as a Feldenkrais teacher to help participants maximize vocal release. Please look at the About page of the Natural Voice Practitioner Network website (www.naturalvoice.net) for a clear outline of the style and approach of this course. FOOD: is delicious, freshly cooked vegetarian. LOCATION: Detailed information on Abbey Sutton Courtenay can be found on their website www.theabbey.uk.com. The nearest bus and train stations are at Didcot Parkway (from where a taxi or bus can be taken). We will give you fellow participant’s contact details close to the course time to facilitate lift sharing. TIMES: Each module will start on the Friday evening (i.e. Module 1: 13th April and Module 2: 8th June). You can arrive after 6pm and an evening meal will be provided. We will finish by 3pm on the Monday afternoon. 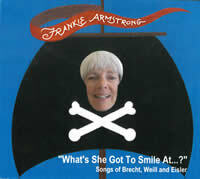 FRANKIE ARMSTRONG (www.frankiearmstrong.com) has sung professionally in the folk scene and the women’s’ and the peace movements since the 1960s. She pioneered community voice workshops in 1975. She continued her previous trade as a trainer in social and youth work alongside the voice workshops for a decade, before focusing exclusively on the voice workshops and singing. Frankie has made 10 solo albums as well as featuring on numerous shared and themed recordings, contributed chapters to 11 books, has written an autobiography (As Far As the Eye Can Sing) and co-edited Well Tuned Women (on women and voice) with Jenny Pearson. Her most recent book (with Janet Rogers) is Acting and Singing with Archetypes. It was her passion for the traditional styles of singing in the British Isles and from around the world that informed the development of her voice and singing workshops. Having been involved with folk and political songs since the 1950s, she’s always been fascinated by the way that voice can enhance the individual’s sense of well being and also develop a sense of community. It can link us to the thread of song that comes down to us from our ancestors. Hence she has always been interested in exploring voice and song in its historical, cultural, political and spiritual dimensions. She also sees the voice as a tool to aid our self-expression, creativity and confidence. Over the past two and a half decades she has especially focused on the body-voice connection, having worked and trained with a variety of bodywork and movement teachers. Whatever the focus of the workshop, she believes in creating a supportive, generous atmosphere where people do not feel judged or under pressure to get things “right”. The intention is to help us all find a creative balance between relaxation and energy. Frankie runs a variety of workshops: If You Can Talk You Can Sing, Singing From the Souls of your Feet, Song Interpretation and Performance Skills, The Joy of Simply Singing Together, The Voices of the Archetypes of Myth, and Voice & Movement – Qualities and Rhythms and does bespoke voice workshops for organizations, theatre companies etc. Over the years she has run workshops with almost every kind of group – for children of all ages and abilities, professional theatre companies, community and women’s groups, people with disabilities, drama students, therapists, psychiatric patients, folk song students and the elderly. And for over 20 years, she has taken ‘apprentices’ and run training groups (often with Darien Pritchard) to pass on her approach and style of voice work. In London, Frankie is a guest teacher at the Central School of Speech and Drama (both on the drama therapy course and the Voice MA), and has worked regularly at the National Theatre Studio. She has been a tutor at International Voice Conferences in the UK, Australia and North America. She is President and founder of the Natural Voice Network (UK), which grew out of these training weeks, and is an honorary member of the Voice and Speech Trainers Association (VASTA) of North America. Sarah Harman originally trained and worked in the theatre, and has been leading singing workshops and choirs since 1988. She has led groups with absolute beginners, disabled people, young people on probation, and in schools, hospices, hospitals and community settings, and has worked in Nicaragua, Australia and Spain. She is particularly passionate about working with disadvantaged communities, and believes that singing together in harmony is a fantastic way of bringing people together in supportive community. Sarah currently runs four community choirs in South Wales and regular ‘Music and Memories’ sessions for people with dementia. She will bring her experience of establishing and leading long term groups to the Voice Leaders training. With a strong belief that leading workshops requires considerable skill, awareness and planning, Sarah has developed workshop materials and exercises to help singers gain the ability and learn techniques for leading effective, inclusive and inspirational workshops.She has been designing training for workshop leaders and voice teachers since the early 90s, and worked as Training Manager for Community Music Wales. She has also worked for the Arts Council of Wales and leads training for Citizens Advice (on Training and Supervision Skills, Mental Health and Dealing with Aggression). Sarah is a song-writer and regular performer in styles ranging from folk to Baroque classical music. She sings with the duo Blameless Hussies, and with her quartet, The Quiet Ranters. The songs she writes and sings are witty and thoughtful, bringing together the personal and the political. Sarah and Frankie have run a variety of trainings and workshops together over the past two decades. These include Access and Inclusion, group-work skills, voice development and improvisation, as well as teaching songs from a variety of cultures and those that focus on social justice. They also perform together occasionally. DARIEN PRITCHARD (www.dynamicmassage.co.uk) has been a body worker for 40 years, including 25 of training massage professionals. He is qualified practitioner of massage and the Feldenkrais Method® of movement awareness. For 12 years, he was a co-director of the Massage Training Institute, a UK-wide organization of holistic massage schools, and for 5 years taught massage in a university degree course. For 30 years he has run a programme of professional development workshops for massage practitioners. He is the author of two massage textbooks. • and aids understanding of aspects of our anatomy and their relevance to giving voice. For thousands of years, our ancestors sang to accompany work, devotion, seasonal rituals and social gatherings – to express joy, grief, rage, tenderness, hope and fear. All these emotions can be given full range through the power and beauty of the voice. To help unlock this, Frankie uses a range of gentle movements and exercises to help relax and free the body and voice. She focuses on how to involve the whole body – to give rise to the voice from the feet on up. She uses chants and songs from around the world, along with simple structures to create vocal ‘events’. Frankie believes passionately that singing is our birthright. For thousands of years our ancestors sang as naturally as they spoke. They sang to accompany everyday activities – at work, at play, at devotion and dance – and for their own pleasure. No one was excluded, so everyone’s skill and confidence developed naturally. This workshop is an opportunity for anyone to explore the melodic voice in an easy-going, supportive atmosphere. The aim is to tap into the joy, strength and energy of singing with others, and to find a range of colour and expression in each of our voices. This is especially helpful for people who have little confidence with their melodic voice. Singing is one of the easiest and most accessible ways to give us a feeling of well-being, relaxation and energy. Singing with others also allows us to create a sense of communal celebration. Recent medical research has verified how parts of the brain’s pleasure centres are stimulated by singing, and how fuller breathing stimulates the circulation. We start with simple body loosening and voice exercises. These lead into ways of playing with creative vocal expression. The workshop also includes songs and chants from different parts of the world. The workshop is open to anyone regardless of their prior experience. We create a supportive, easy-going and playful atmosphere, with an approach of exploration rather than ‘getting it right”. Historically, song has been used to bind communities, pass on stories and legends, comment on contemporary happenings, poke fun and amuse, commemorate / celebrate life’s important events, and to accompany work, devotion and recreation. Lacking these community contexts, how do we find our way into the heart of a song and communicate it? Indeed, how do we select songs, why do they speak to us, and why do we wish to sing them to others? This workshop explores how best to sing a song in the light of these questions – exploring such essential ingredients as vocal quality, phrasing, emotional truth and presence. There will be time for any participant who wants to work on a particular song. Our voice is the most intimate expression of ourselves – both in speech and song. This workshop offers an opportunity to explore our voices, and to discover the wondrous variety of expression, colour and range that we are capable of. We will create a supportive, non-judgemental space and use many simple and enjoyable games, exercises, chants and songs to aid relaxation and freeing voice and body. So much of what we communicate is in the ‘music’ of the voice. Hence the greater awareness we have of our own ‘music’, the more effective we can be. Everyone is welcome but this workshop is of particular interest to those who use their voices as their professional instrument of communication – e.g. teachers, trainers and counsellors.